The Lancaster Insurance Classic Motor Show is taking over the NEC this weekend, and it’s the one British show not to be missed. Not only is it the biggest gathering of British Car Clubs all year, with over 2500 cars on display, but there’s tons of activities and special events going on. Here’s what’s not to be missed! • Salvage Hunters’ Drew Pritchard will lead a line-up of TV stars to join Wheeler Dealers Mike Brewer and Ant Anstead on the Discovery Live Stage. 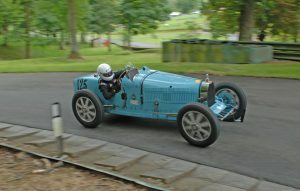 The Bugatti Owners Club, with the support of the historic Bugatti Trust, will showcase a unique collection of nine original Grand Prix Bugattis at the Lancaster Insurance Classic Motor Show, with Discovery, held 10-12 November at Birmingham’s NEC. From the legendary supercharged 8-cylinder Type 35B through the ex-Richard Shuttleworth twin overhead camshaft supercharged Type 51 to the immortal Type 59, these breath-taking machines are art in motion. Each Bugatti on display claims a significant racing history both pre- and post-war. 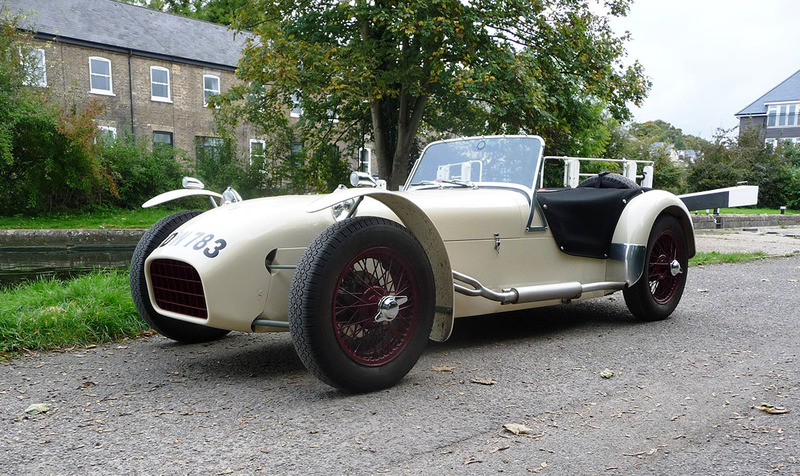 For the younger enthusiasts, four original Factory built ‘Baby’ Bugattis are assembled on a mock racing grid which will fit in well with the overall show theme of ‘Family Ties’. A feast to the eyes for all ages, the vintage Grand Prix Bugattis confirmed for display include the Type 35, 35A, 35C, considered to be the most successful of the Bugatti racing models, the Type 37 and 39 derivatives, Type 51, 54 and 59, which succeeded the Type 35 as Bugatti’s premier racing cars for the 1930s. Don’t miss this stunning display in Hall 1, Stand 320 or visit www.bugatti-trust.co.uk for more details. 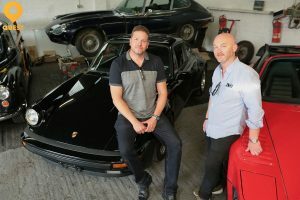 Salvage Hunters’ Drew Pritchard will lead a line-up of TV stars from Quest to join Wheeler Dealers Mike Brewer and Ant Anstead on the Discovery Live Stage. One of the ‘not-to-be-missed’ features at the Lancaster Insurance Classic Motor Show, with Discovery, held at Birmingham’s NEC from 10 – 12 November, the Discovery Live Stage will be jam-packed with game shows, interviews, car parades and a restoration challenge. Drew, known for his amazing knowledge on antique collectibles and artefacts, is also a huge petrolhead with an eye for collector car. Always on the hunt for that elusive gem, Drew has turned a childhood love of visiting car scrapyards to unearth rare and beautiful items into a thriving international business enterprise – and a hit TV show on Quest. Drew will be joined by fellow car nut Paul Cowland, from TV’s Turbo Pickers. The pair are launching a new show heading to Quest early 2018 – Salvage Hunters: Classic Cars. In the show, Drew and Paul team up to start a new business; they will find, buy, fix-up and sell classic cars and retro motorbikes. Also bringing a new show to Quest and making a welcome NEC Classic return is Jimmy De Ville, star of TV’s Engine Addicts and car customiser. With a nod to the name of the legendary British engineering company, comes the brand, new series Goblin Works Garage, launching exclusive to Quest in early 2018. Jimmy will bring some of the unique vehicles from his own garage, after last year bringing his jet-engined boat! He will be joined by his fellow workshop mates Ant Partridge, a custom motorcycle designer and builder, and Helen Stanley, one half of Skull & Pistons Garage. The Historic Lotus Register will be making its first appearance at the Lancaster Insurance Classic Motor Show, with Discovery, at Birmingham’s NEC from the 10-12 November with a truly spectacular display. In keeping with the ‘Family Ties’ theme of this year’s show, the Register has arranged a stunning selection of seven cars, each representing both the story of the marque and a milestone in automotive history. The Mark VI was the company’s initial ‘production model’ while the Twelve, the Eleven, the Elite Type 14 and the Seven will all be celebrating their 60th anniversary at the show. The Twelve, which became the first Lotus Formula One entry, and the Eleven, which won the 1957 Index of Performance at Le Mans, were the result of Colin Chapman’s pioneering experiments into the use of aerodynamics on a racing car. The London Motor Show of that same year saw the debut of the Elite – one of the greatest sports cars of the post-war era and the first vehicle in the world with a self-supporting GRP body. Such is its appeal, the Lotus Twelve Registrar Mike Bennett will be travelling from Adelaide, Australia, to attend the show as additional support on the stand. Now that’s what you call a family! As for the Seven, it is a true automotive icon and the Register will be presenting three prime examples at the NEC, from an early Series One model to a Series 2, the Lotus forever associated with The Prisoner. “This is our first time at the NEC and we are thrilled at the chance to celebrate Lotus’ past and to welcome a new generation of enthusiasts to our stand,” said Philip. 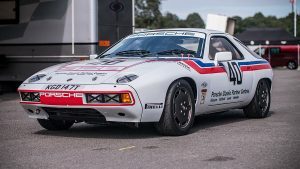 Porsche GB will celebrate 40 years of the 928 at this year’s Lancaster Insurance Classic Motor Show, with Discovery, held 10-12 November at Birmingham’s NEC. To mark the anniversary, four UK Porsche Classic Partner Centres have entered a 1978 928 in the 2017 season of the HSCC 70s Road Sport Championship, with racing legend Richard Attwood at the wheel. In 1977, Porsche launched an all new front-engined sports car. Originally designed as a replacement for the 911, the 928 was a luxurious grand tourer powered by a Porsche designed 4.5l V8 engine producing 240hp. A focus on lightweight construction saw the extensive use of aluminium for the body panels rather than traditional sheet steel. The 928 never did replace the 911 yet still secured its place in Porsche history as an outstanding luxury GT car and the last of the traditional 2-door, transaxle models. British racing driver Richard Attwood raced for the BRM, Lotus and the Cooper Formula One teams, competing in 17 World Championship Grand Prix, achieving one podium and scoring a total of 11 championship points. He was also a successful sports car racing driver and won the 1970 24 Hours of Le Mans race, driving a Porsche 917. As part of Porsche GB’s support of its heritage, it now has four dedicated Porsche Classic Partners in Glasgow, Hatfield, Leeds and Swindon, which are centres that have exceptional classic experience to provide support and parts for its historical models as well as offering classic Porsche vehicles for sale. James Toye, Business Development Manager for Porsche GB, said: “For us, tradition and innovation are bound closely together. More than 70 percent of all Porsche vehicles ever built are still on the road and therefore play a defining role in shaping the fascination of the brand. “Porsche Classic is highly committed to prolonging the service life of every classic Porsche, offering experts who combine service and advice with the relevant expertise and enthusiasm. Each Classic Partner showroom has a Classic Corner, featuring vehicles and parts displays that tell you at first glance that you and your classic car are at the right address. Exclusive interview: Wheeler Dealers’ Ant Anstead!